HydroTops Soil Solo Bloom is pH balanced and formulated to allow for maximum assimilation of nutrition required during the flowering period. With this heightened ability to consume all available nutrition so quickly and effectively, HydroTops Soil Solo Bloom helps your plants to produce heavy yielding flower sets and abundant aromatic oil production, leading to harvest of superior quality and quantity. During the flowering phase, your emphasis shifts towards creating large flower sets and abundant essential oils. Use Hydrotops Solo Bloom at a rate of 4-6ml per litre from week 4 of the flowering cycle. Begin with a light feeding of 4-5ml per litre, gradually increase to 5-6ml per litre maximum by week 5,6 and 7 of flower. Decrease to 4-5ml per litre by week 8 of flowering, before combining with Hydrotops Flush at a rate of 1-2ml per litre for one final week, prior to harvest. 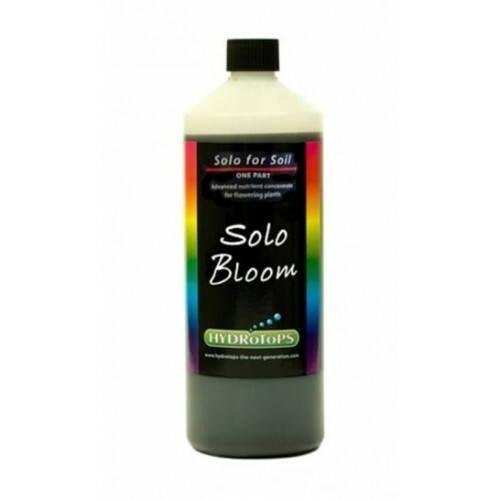 HydroTops Soil Solo GrowHydroTops Soil Solo Grow is pH balanced and formulated to allow for maximum ..